The Animated Woman: Bungee GOLF. *Pickles and weasels don't usually go together. Brought to you by the King of Incongruity himself...PICKLE Weasel!! Never has the blood rushed to your head with such eloquence and style. Yes, you can now merge your two favorite pastimes, satisfying cravings for both social games and death defying foolishness. Bungee GOLF takes "multi-tasking" to an extreme! Witness the birth of the PICKLE Weasel. And I love the coincidence. I blogged about The Wide World of Lame Sports yesterday, and bungee golf would be leading the list of must-watch sports. Guys. 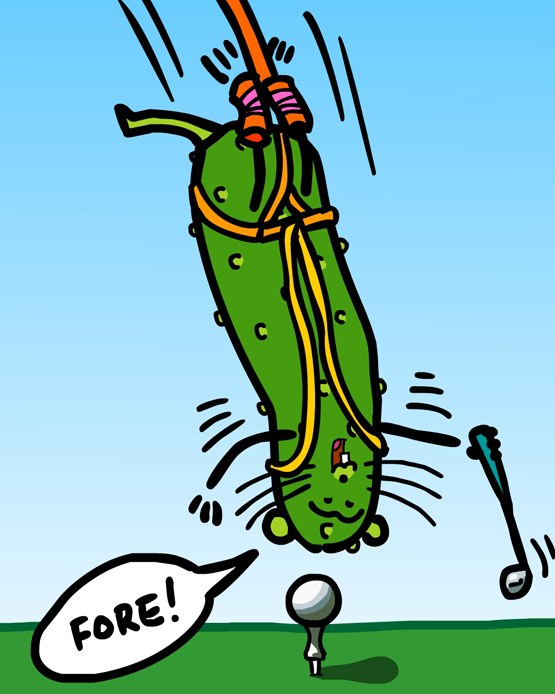 In Bungee GOLF, all the rules are made up as you go along. It's more fun that way! What if I told you you're SUPPOSED to hit it into the pond...? As always your nonsense makes perfect sense to me! Bungee golf, of course, why haven't they had this on ESPN yet???? It's lucky Tiger Pickle has those little lumps on his body to keep from slipping through the cords. Hole in one, AW! A hole in one!! YES!! Thanks LakeFX. Did everyone get my puns Slice and Cut "Pickle" maybe I should have said bad puns LOL no justice to a great cartoon. How cute is that! And I loved the comments others made with puns! I am not good with golf-only tried it once with a then-boyfriend who immediately decided I had better just accompany him. : p. But, Bunjee Golf looks hilariously fun! Smiles! Man, he rocks the golf course. Look at that swing! Look at that form! PW really knows how to play a round!